Co Co the Larson Lakeveiw Bulldogge at 5 years old—"Co Co is a wonderful dog. He loves to play and have fun. Larson Lakeveiw Bulldogges are a wonderful breed." The Larson Lakeview Bulldogge is bred for size and strength and is therefore bigger than the Olde English Bulldogge. The square head is large in proportion to the body and moderately wrinkled. The forehead is flat and deeply sunken between the eyes. The eyes are set low on the head and spread far apart. The lower jaw is turned up and protrudes beyond the upper jaw. The jaw muscles are large. The muzzle is short and broad. The bite is square but undershot. The canines are large. The ears are set high and wide and may be either rose or button shaped. The dewlap consists of two folds. The flews are semi-pendulous. The neck is short and not quite as wide as the head. The body is very muscular, yet symmetrical and well-proportioned. The very broad shoulders have well-proportioned muscles. The chest is deep with well-rounded ribs. The belly is tucked up. The front legs are straight or slightly bowed. The back legs are well muscled, yet proportioned equally and not pigeon-toed nor cow-hocked. The thighs are very muscular. The tail is cork-screwed, pump-handled, or bent and tight to the body. The coat is short, close and medium in coarseness. The color is usually brindle on white. Brindles consist of red, grey, black or brown. Complete calicos also exist. The Larson Lakeview Bulldogge is very friendly, yet a fearless adversary to anyone or anything that threatens its family. The objective in training this dog is to achieve pack leader status. It is a natural instinct for a dog to have a order in its pack. When we humans live with dogs, we become their pack. The entire pack cooperates under a single leader. Lines are clearly defined and rules are set. Because a dog communicates his displeasure with growling and eventually biting, all other humans MUST be higher up in the order than the dog. The humans must be the ones making the decisions, not the dogs. That is the only way your relationship with your dog can be a complete success. Height: Males 20 inches (51 cm) and up. Females 16 inches (41 cm) and up. The Larson Lakeview Bulldogge will do okay in an apartment if it is sufficiently exercised. They are relatively inactive indoors and will do best with at least an average-sized yard. They need to be taken on a daily, brisk walk or jog. While out on the walk the dog must be made to heel beside or behind the person holding the lead, as in a dog's mind the leader leads the way, and that leader needs to be the human. 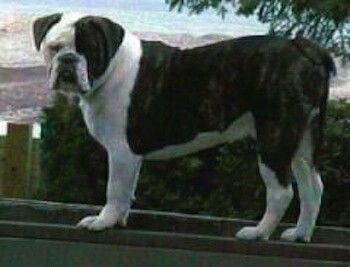 The Larson Lakeview Bulldogge was developed by Kevin Larson at Larson Lakeview Kennels. It took seven years of genetic breeding between the American Bulldog, English Bulldog, Mastiff, American Pit Bull Terrier, Bullmastiff, and Bull Terrier to create this breed.